Changes in brain oxygenation in premature babies essentially reflect changes in blood flow to the brain. If we compare changes in the baby’s blood pressure with change in blood flow to the brain we can get information on how well the cerebral circulation is being regulated – a process known as cerebral autoregulation. In healthy babies (and adults), cerebral blood flow remains relatively constant over a wide range of blood pressure, however in sick infants this control is lost and any fluctuations in blood pressure is transmitted to the brain. This leaves the brain vulnerable to low cerebral blood flow (ischaemia) and high cerebral blood flow causing haemorrhage into the brain. Using a small near-infrared light sensor (NIRS) placed on the head of the baby, we are able to measure the blood oxygen in the brain and our aim is to identify not only those babies who are unable to autoregulate, but also calculate the optimal blood pressure to maintain autoregulation with the hope that this will prevent brain injury. Recent work has identified a novel index of cerebrovascular reactivity; known as tissue oxygen heart rate reactivity index (TOHRx), this relates correlation between the brain tissue oxygenation and heart rate. This index has been used to estimate optimal blood pressure (MABPOPT). In a study of 60 preterm infants less than 48 hours old, the divergence of the infants MABP from MABPOPT was significantly greater in those who died. 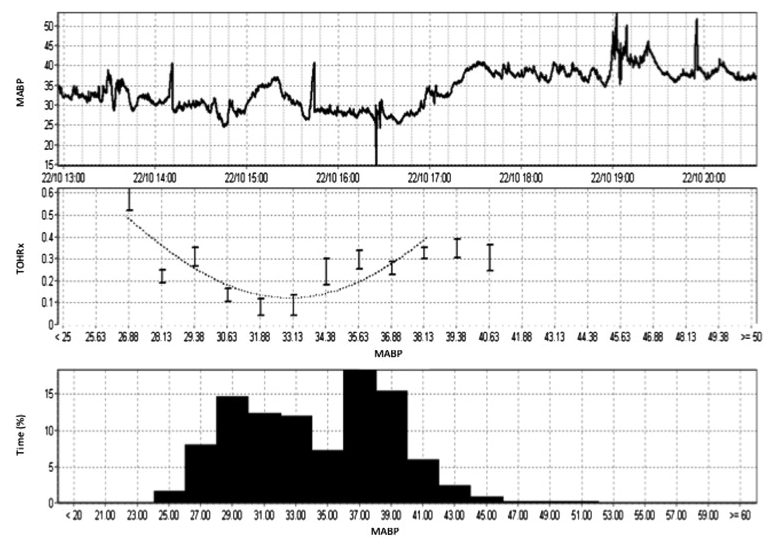 Example of TOHRx over MABP plot to determine the MABPOPT in a single patient: a male preterm infant born at 25 ± 2 weeks’ gestational age with a birth weight of 860 g who was studied within his first 36 hours of life for 23 hours. This infant was ventilated and was not on inotropes during the recording study period. The first graph shows the infant’s actual MABP. The second graph shows MABPOPT curve. MABPOPT is defined by the value of MABP where TOHRx is minimum. The frequency histogram shows the percentage of time spent in each value of MABP. (da Costa et al, J Pediatr, 2015).